We had around 84 students. Everybody knew everybody...unless you transferred in the last day of school! 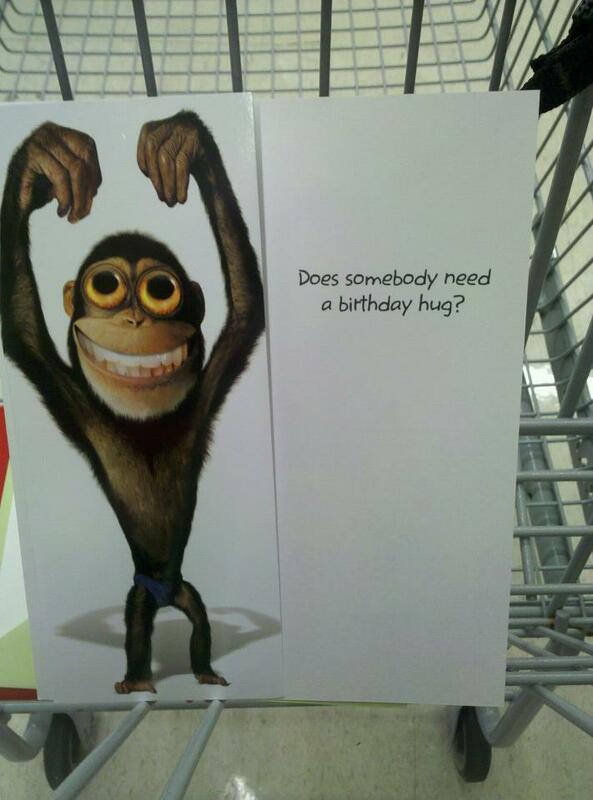 I saw this card in KMart and had to take a picture of it for one of the teachers I work with. There's a story to it, which I won't get into here. Just know that this teacher is not a touchy-feely kind of person (although she's a totally awesome teacher!). 3. Pickles-love 'em or loathe 'em? If its love what's something you eat that needs a pickle? I can actually take them or leave them. I don't like pickles on sandwiches or hamburgers, but I'll eat them on the side. The pickles we have at the concession stand at football games are really good...I've been known to sneak a few before they go out on the condiment table. The crunchiness paired with the juiciness and slightly sour: YUM! 4. What's a stereotype you seem to perpetuate without meaning to? Being one of the "bratty younger children" in the family. Just ask any of my siblings...they'll tell you! 5. Ever been horse back riding? If so is it something you enjoy? If not, do you have any interest? Did you watch the Kentucky Derby? Will you be watching the last leg of the Triple Crown this weekend? I've been horseback riding, but it's been so long I don't know if I enjoy it or not! I don't watch horse racing. I've been to the dog track in Florida once, though. What wedding movie don't I like? I don't know that I have a "favorite". So many attractions, so little time! The Grand Canyon. Although I really want to go to New England in the fall and see all of the colors. As I'm writing this, I'm watching the Queen's Jubilee Celebration on tv. I just love how the Queen always has her purse with her! It's so cool to see things on tv that I saw in October. Trafalgar Square: what is it about that place that I love so much? We went horseback riding up in the Smokies a few years ago...it was fun. There are quite a few places up there that take you out into the mountains. My graduating class was small and we knew everyone including their families. Watched the concert and enjoyed the music and seeing Buckingham Palace all lit up. I get the no touchy feely thing. I care a lot but had no need to handshake or hug to prove it. I have seen both of your tourist places....the grand canyon is amazing and is such a statement of the power and might of God. My favorite would have to be New England in the fall...there is nothing more beautiful anywhere....and you know I love the Smokies in the fall. Small school must have been awesome. I have seen many wonderful sights but they were all 40 years ago...it's time to do it again. I want to see central park in the Fall. I enjoyed the Queen's Jubilee. You do realize that you still would have known the new kid had not joined on the last day. The new one gets ALL of the attention!! Glad you're enjoying your vacation!! I would have a tough time, too, picking just one destination. The Grand Canyon and New England are both places I would like to see.